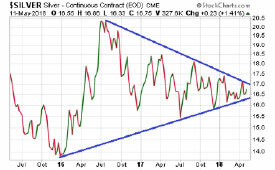 A bearish breakdown could quickly pull prices back down to the $14/oz level…while a bullish breakout would target $20.50 and potentially much higher beyond that. The latest Commitment of Traders (COT) report shows silver futures speculators positioning on the bearish side. They are holding net short positions of around 20,000 contracts, a historically large bet on lower silver prices. This lopsided positioning has persisted for the past few weeks in silver. The good news for bulls is that when speculators pile on to one side of the market in a big way, it usually backfires on them. Taking the opposite side of the hedge funds and other speculators when their positioning gets extreme is usually profitable, though not always immediately so. This isn’t a timing tool for day traders. Long-term investors shouldn’t be overly concerned with the machinations of the futures markets. The largest and most influential market for metals prices is the U.S. COMEX exchange. The quote for immediate settlement at any given time is effectively the spot price. Although important in setting spot prices day to day, they are irrelevant to the fundamentals of physical supply and demand. Spot (paper) prices can sometimes diverge from real-world pricing in the markets for physical precious metals. For example, during periods of extreme stress in markets it may be impossible to obtain physical metal anywhere near the quoted spot price. Premiums on retail bullion products may surge as a consequence. When the physical market diverges from the paper market, wholesale over the counter prices may be more realistic than spot prices. The massive short positions currently being taken out on COMEX silver all represent future buy orders. At some point these short positions need to be covered (bought back). When prices break out above an important resistance levels, that can trigger panic short covering that further exacerbates the intensity of the breakout. The silver market appears to be on the cusp of something big. After months of consolidation that have been frustrating to many bulls, they now have a near ideal setup – a launching pad for the next directional spike. Stefan Gleason is President of Money Metals Exchange , the national precious metals company named 2015 "Dealer of the Year" in the United States by an independent global ratings group. A graduate of the University of Florida, Gleason is a seasoned business leader, investor, political strategist, and grassroots activist. Gleason has frequently appeared on national television networks such as CNN, FoxNews, and CNBC, and his writings have appeared in hundreds of publications such as the Wall Street Journal, Detroit News, Washington Times, and National Review.